If there was any uncertainty about what has taken over the election campaign since it first started Quebecers were reminded after Monday night’s English language debate. Throughout the debate—the first ever televised—the topic of immigration continued to take centre stage. Both Jean-François Lisée, leader of the Parti Québécois, and Philippe Couillard of the Quebec Liberal Party attacked the Coalition Avenir Québec leader, François Legault’s stance on immigration repeatedly. Legault has remained adamant on his stance that Quebec needs to change the way it chooses immigrants, adding that 26 per cent of newcomers leave the province. To repair this, Legault said newcomers should have to take a French test and a Quebec values test after their first three years. “I don’t hear all my colleagues say positive things about immigrant lately,” he said. This lead to both Couillard and Lisée once again criticizing Legault’s plan for immigrants, saying it’s “distressful” and “nonsensical.” Couillard also said it’s made immigrants afraid of Legault, who says immigrants will be reported as being in Quebec illegally to the federal government if they fail the test. “He wants to run test through immigrants and sanction them with expulsion, I’ve never heard this in Quebec ever,” Couillard said to reporters post-debate. Sticking on the topic of immigration, Québec Solidaire spokesperson Manon Massé claimed her party is the only to support public inquiry on systematic discrimination. “None of them were able to do that,” she said. “We know that systemic discrimination exists here in Quebec. It’s not to make people afraid about what could happen, but it’s the right of these people to be recognized,” said Massé. 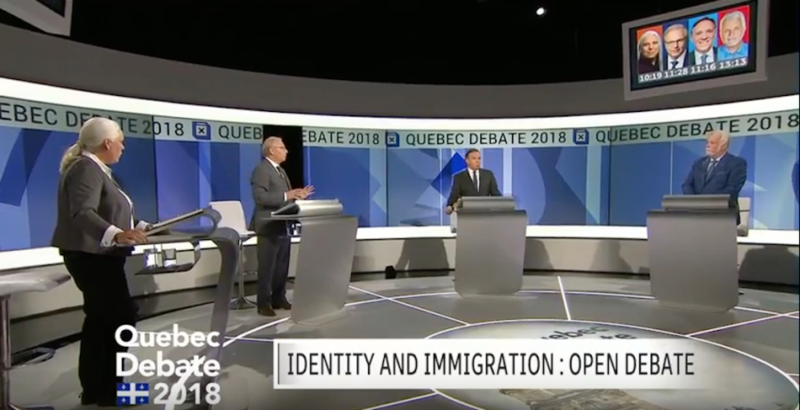 While the topic of immigration continued to take place post-debate, Massé took the opportunity to change the topic and discuss the environment instead, focusing on her party’s plan to transition Quebec away from fossil fuels. When asked about how to respond to climate change, Lisée said he PQ has a plan to put aside $100 million to make sure nursing homes and hospitals have air conditioning before next summer. The topic of Quebec’s recycling system also came up. Up to 80 per cent of recycled materials were shipped to China, but in Jan. 2018, it was announced that China would no longer import recyclable materials from Canada. Lisée resolved that they “need to reform” the way recycling is currently handled. Towards the end of the discussion, Legault added that the PQ and Liberal party don’t have any lessons to give to the Quebec population, because, he said, the two parties were of “buying votes” in Gaspésie after investing $400 million in a cement factory. Each leader was asked what can be done to help English-speaking students remain and work in the province. Lisée, Massé and Legault all had similar ideas on how English-speaking students could better learn French. “We are proposing that CEGEP students have an enriched track of French and have an immersion session in a French CEGEP of their choice, so they can be as good in French […] with their Franco counterparts,” said Lisée. Legault suggested that English-speaking students take a full immersion in the fifth or sixth grade to better learn the language. As for ensuring the survival of English school boards, Massé said QS wants to reinvest in education system and help improve classroom conditions. In early September it was announced that QS would invest $2 million in education. Massé added that they will provide better pay for teachers while also reducing the number of students in each classroom. “All the parties committed themselves to balancing the books, I’m not the only one. Now we have the means of our ambitions,” Couillard said. He added that he wants for there to be free daycare for four-year-olds, and to give better pay to teachers starting from grade seven. The debate on education eventually lead to a free-for-all between Lisée, Legault and Couillard, leaving no time for Massé to speak. The provincial campaign will continue to he in full affect with Concordia University will also be hosting an all-parties, provincial election debate on student issues, Friday night at 6:30 p.m. at the D.B. Clarke Theatre.